So I was feeling really fat this week, I totally blame Thanksgiving, and I was in the mood for breakfast. So we decided to go to one the best Pancake places in Orange County. Haute Cakes Caffe has been an O.C. staple since 1990 and is the perfect place to go for an amazing breakfast with a very low key style. Located in the Westcliff Court it is a perfect place for dining al fresco. The food here is truly a made by people that love what they do, and the neighborhood has loved them since the beginning. They are only open for breakfast and lunch and they close by 3 so get there early. The menu is fresh and there is something for everyone, but the true stars of the show are the Haute cakes, from traditional Buttermilk Haute Cakes to the Orange Ricotta Haute Cakes that take a little longer to prepare and have moist consistency inside and topped with warm berries, all of them are out of this world. Since we did not want to die of gluttony and wanted to try a little bit of the whole menu we tried something from each section. 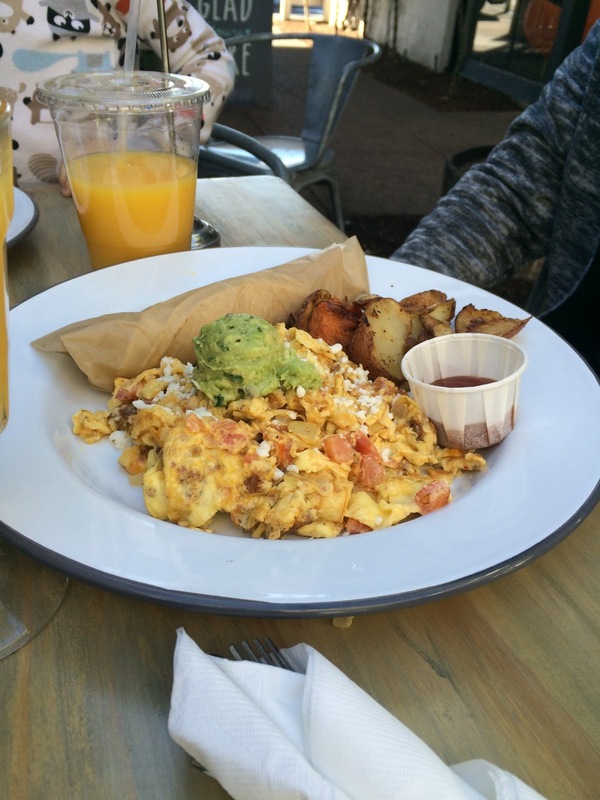 The Mexican Scramble: Two eggs scrambled with Chorizo, Tomatoes, Onions, topped with Queso Fresco, Guacamole and house made Salsa Verde, and served with Corn Tortillas, was superb. The flavors blended together perfectly. The corn tortillas tasted homemade, but I wasn’t positive, really made for a great breakfast . Avocado Toast: Two Scrambled eggs, smashed Avocado, Heirloom Tomatoes, Rosemary Sea Salt, Sourdough Toast, was out of this world. I did refrain from just putting both sides together and making a sandwich, but it ate well with a knife and fork. The Avocado in the dish are the star and lightly seasoned and bring a freshness and flavor that really pulls the dish together. Blueberry Cornmeal Haute Cakes: served with real Maple syrup and butter, and that’s all you need. They are golden on the outside and soft and moist on the inside. They are rich and flavorful and easily the best things we had at the table. The Haute Combination: Two eggs, Buttermilk Haute Cakes, Bacon or Sausage. This is the most traditional item they had, but don’t let that fool you, this breakfast is just what the doctor calls for when you want a great breakfast. Only the best ingredients in each of items and the Buttermilk Haute Cakes are light and fluffy. This is definitely not something you will taste at a chain breakfast place. They have a limited cocktail menu, Mimosa’s and Bloody Mary’s, and beer and wine, makes it a great place to go to get out of the house and have a breakfast that will either put you back to sleep, cause it’s so rich and flavorful or if you go for a lighter fair, will get you out of the house and get your day going. December 8, 2015 in Haute Cakes, Pancakes.